Willian could still be headed to Manchester United this summer, according to reports. Spanish sources say that Chelsea have lowered their asking price for the 29-year-old right winger. Earlier in the week, Barcelona decided to make a move for Bordeaux wide man, Malcom instead of pursuing a move for Willian as The Blues refused to reduce their £70m valuation of the Brazilian. Mundo Deportivo report that Barcelona officials believe that the player could still be headed for a Chelsea exit despite him not joining the Camp Nou outfit. According to multiple reports, Barcelona had bids of up to £60m rejected by Chelsea for the services of Willian before shifting attention to the signing of Malcom, who looked destined for a move to Roma. 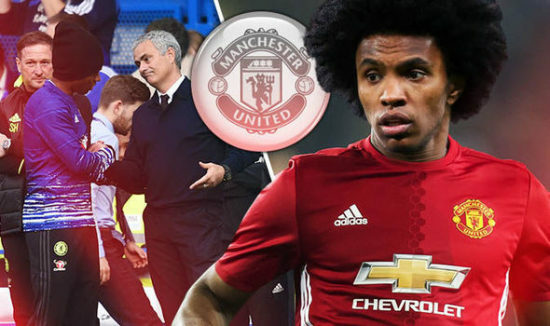 Willian is also wanted by Jose Mourinho to add more bite to his attack. The increased speculation about the future of Anthony Martial means that Willian could still be a new arrival at Old Trafford, and here’s how he will look in Man United shirt if he completes the move from Chelsea. Despite the best efforts of Maurizio Sarri, who wants the player to be part of his revolution at Stamford Bridge though it is believed that he is ready for a reunion with Jose Mourinho in Manchester. Manchester United boss, Mourinho has been moaning about a lack of transfer activity in recent weeks following the early arrivals of Diogo Dalot and Fred. Willian would represent a statement of intent as we look to claw back the title from Manchester City. He joined Chelsea in the summer of 2013 under the tutelage of Jose Mourinho and has since won the Premier League twice, the League Cup, and FA Cup in his time at West London. It will be good if Willian signs for Man Utd but the sale of Martial will not be acceptable by me. William would be amazing addition to United’s attack.